Girls Wear Blue Too: Hello Possum! Hello lovely readers, if anyone is still out there reading that is :) No flowers again today but I thought I'd pop in a show you some pics of our lovely little visitor from last night. this one was fairly timid and on full alert looking and sniffing something out, I offered her some apple and she let me get quite close, though I wasn't willing to get too close, as you just never know with these creatures. She ignored my apple and come down the tree then headed off across the yard on the ground in the direction of the apricot tree. The fruit right up at the tippy top is ripe and the cockatoos have been dropping it all down onto the ground. The Cockies rip the fruit off and want the seed for its kernel, they are so wasteful! I hope to get back to some more regular posting soon and share what has been going on here, we've been focused inwards dealing with a family situation and are making a pretty big change for someone in our little family in 2014, and this requires a lot of though, discussion and planning from us as the change for one will affect us all. Good luck with 2014. I hope it is a good year for you. Family changes can be hard, Been there and done that with several and am working through anothre one with my son whose wife has left him. 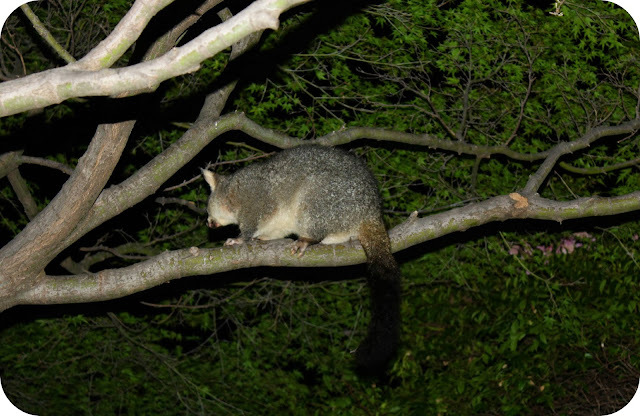 We had many possums at Killara at Sydney's a North Shore. Very noisy. We had 40 acres of bush in the Hunter Valley outside Cessnock. Our house had a pitched roof and the adults square danced all night down one end, while the youngsters used the pitch as a slippery slide down the other. What with the wombats trundling through and grunting, and the noise of the koalas either mating or fighting and the occasional howl from a wild dog several valleys over, the place was noisy. 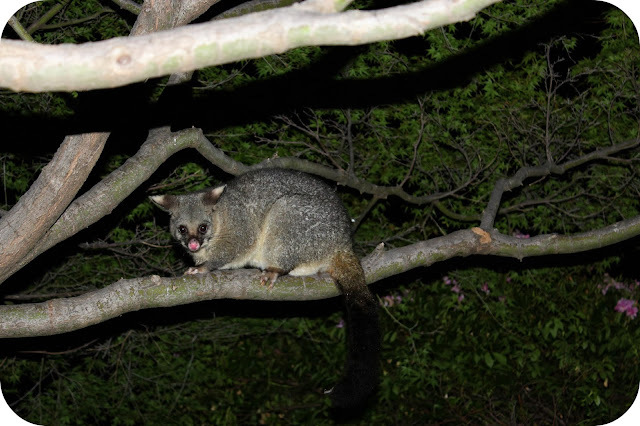 We lived in North Manly for a little while and I remember seeing possums there too and watching one carrying her baby about in the big old tree's. It sounds like you had a true Aussie cacophony happening there in the hunter Valley Jan.
Tammy, I had an altercation with one in our shed last Sunday as I interrupted its sleep. It wasn't happy so I stayed well away. My husband thinks there are at least two perhaps three who have made their home in our shed. They make such a racket on the tin roof at night. We occasionally hear a loud clattering over our tiles before we head off to be, which we assume to be a possum I can only image the ruckus that would come from them crossing tin!